in the Legislative Assembly of Assiniboia by Hon. George Gunn. St. Ann’s was also spelled as St. Anns and St. Anne’s and was also known as Poplar Point. The electoral riding/ parish is not to be confused with Ste.-Anne also known as Point des Chêne, Sainte-Anne-Pointe-des-Chênes, Ste.-Anne des Chênes, and as Oak Point (which is in turn not to be confused with Oak Point/ St. Laurent/ Manitoba/ Manitobah on the shore of Lac des Prairies/ Lake Manitoba). Settlement at Poplar Point along the Assiniboine River began prior to the construction of a church. Many inhabitants migrated from older parishes on the Red and Assiniboine Rivers as river frontage became less available. Archdeacon William Cockran arranged for the construction of St. Anne’s Anglican Church, beginning 1859. Building with logs assembled in the Red River frame style began in earnest in 1862. The church was completed in 1864. The first incumbent minister was Reverend John Chapman. 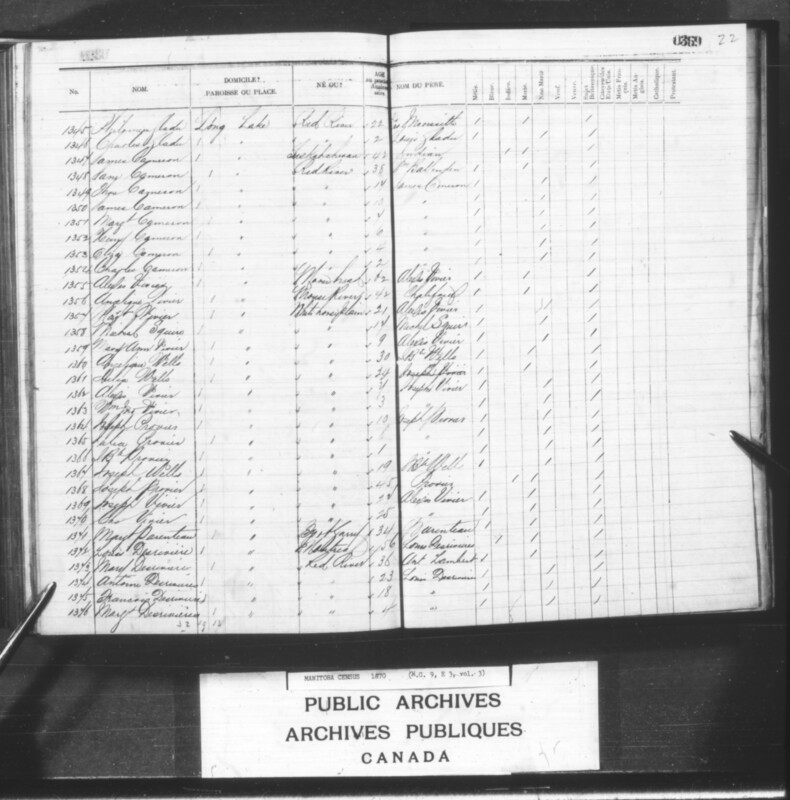 For the census of 1870, inhabitants of the Long Lake Settlement were enumerated under a separate heading. Winterers, who had left on the fall hunt, were also counted, though they were identified as absent. 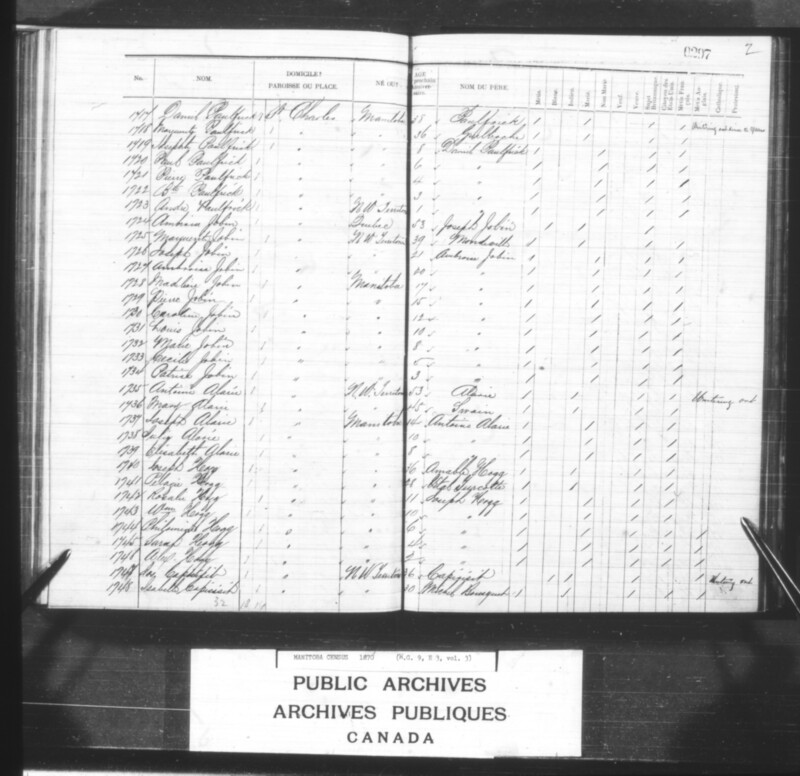 It is not clear whether the people of Long Lake and wintering buffalo hunt families were included as voters of St. Ann’s/ Poplar Point or of Whitehorse Plains for the elections for the Legislative Assembly of Assiniboia. Unless historical evidence is found that indicates a different placement would be more accurate, both groups will remain listed below. Although many parishioners of Poplar Point professed to be Protestant, there were also those who professed to be Roman Catholic (designated ‘RC’ in the list below). 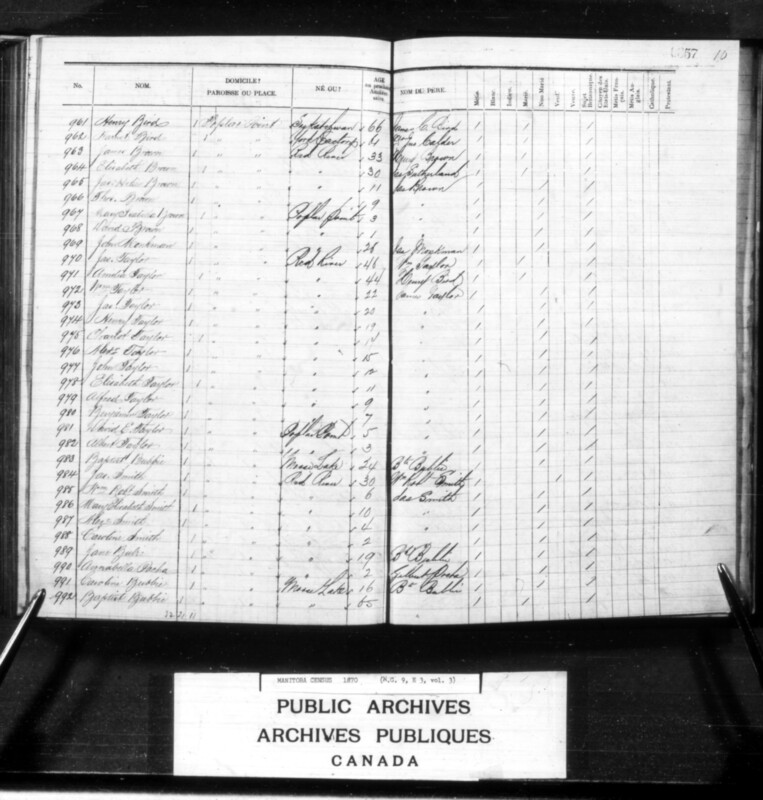 Member of Canadian survey crew? Arrested as a member of the ‘Portage Party.’ [See Prisoners, this site.] Afterwards moved to a location at or between lot 1-6 Headingly. 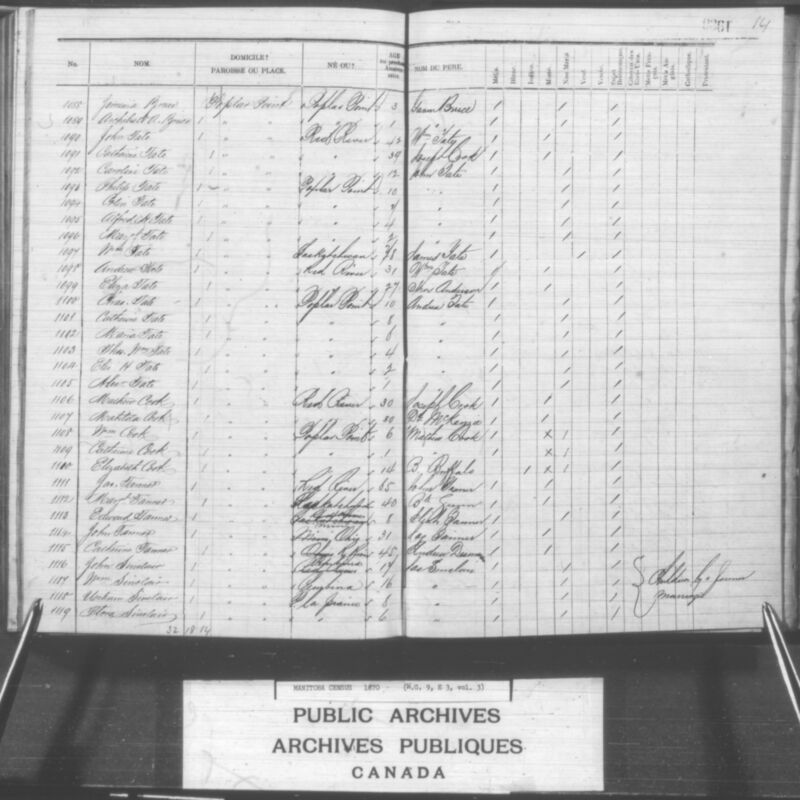 – [810-813] Elizabeth Ann 14, George 11, Edwin James 6, Archibald 2. – [817-822] Duncan Richard 18, Colin C. 15, Roderick McKenzie 14, George William 10, Ellen May 10, Alexander H. 8. – [825-826] Albert George 3, James 1. – [829-832] Thomas 22, Edwin 17, Catherine Maria 15, Sarah 9,  Charles John 5. 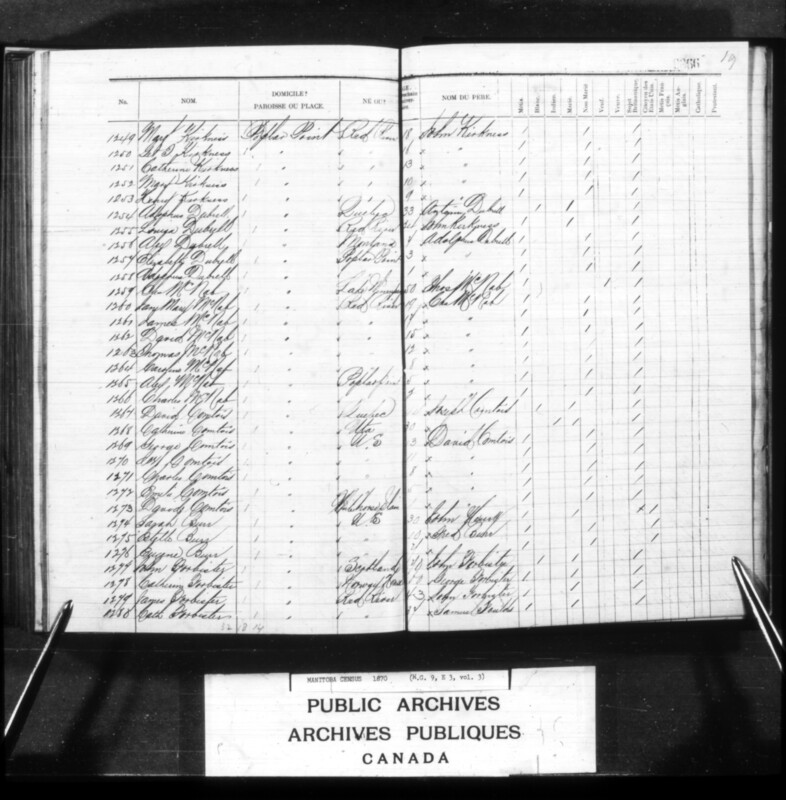 – [840-843] Archibald 6, John George 5, Jemima Ann 3, Elizabeth J. 1. 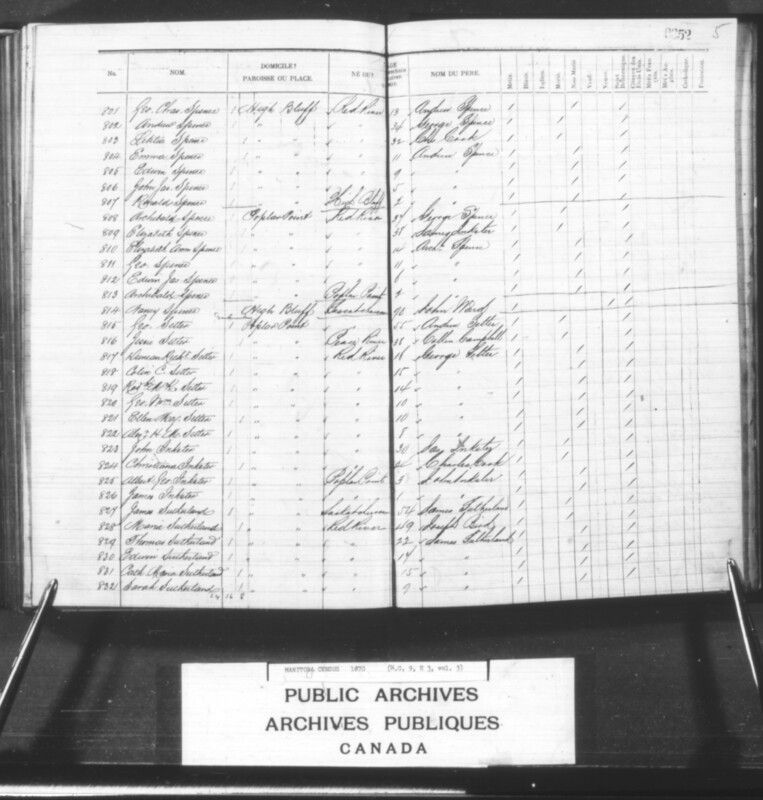 – [844-846] (Métis) Sarah 23, Isabella 20, William 18. 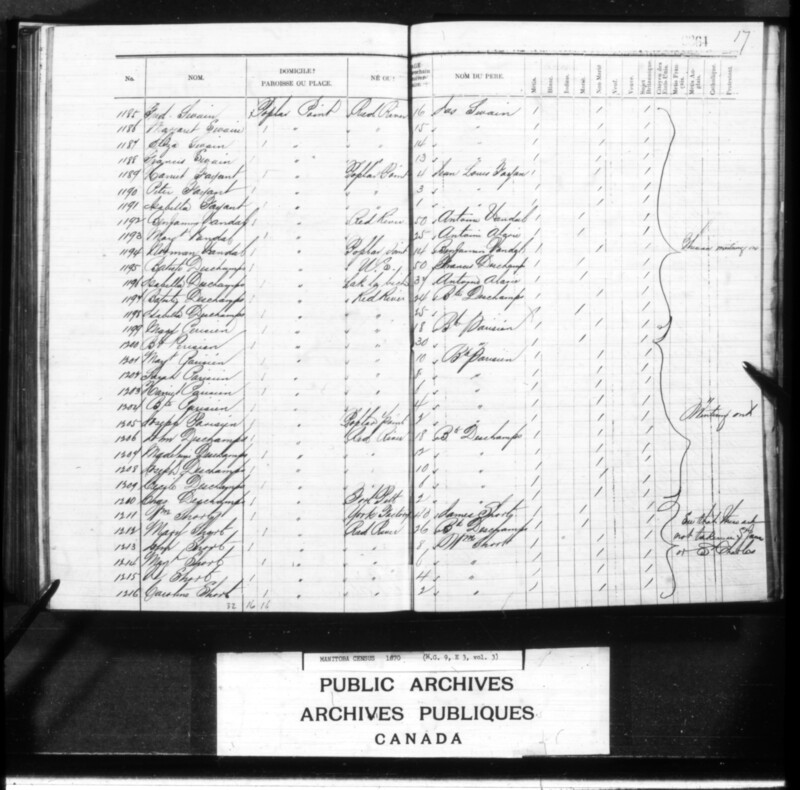 – [849-852] Margaret Mary 8, John James 6 Joseph George 4, Barbara 2. – [855-858] Elizabeth 15, Isabella Ann 8, William 4, Margaret 2. –  Henry 24,  John Thomas 18. – [953-955] Edward 18, Mathilda 12, Richard 9. – [958-960] Mary Jane 6, Margaret 4, Sarah 2. 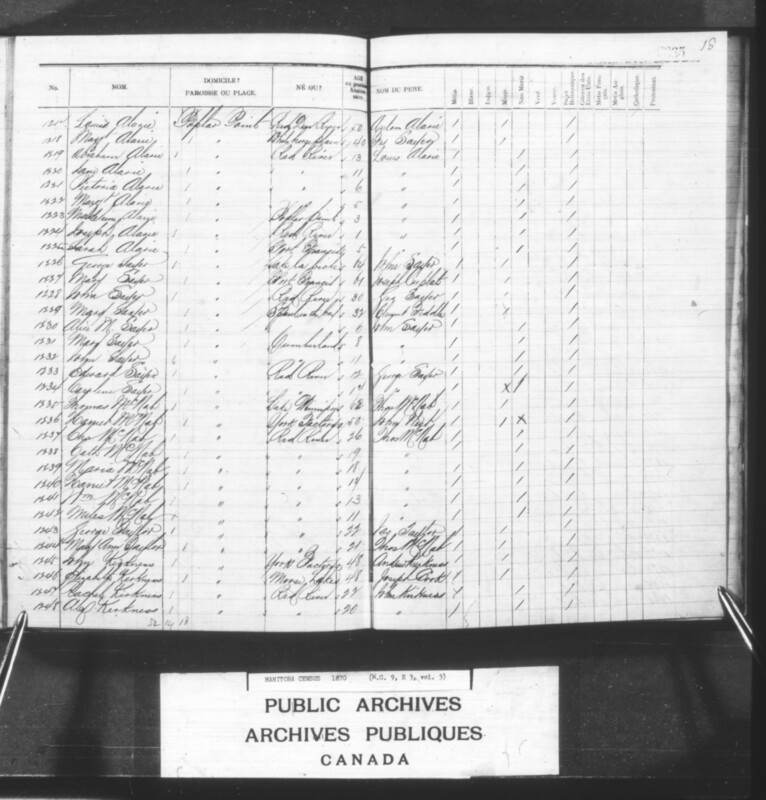 See also HBCA biographical sheet; biography; genealogy. Half-brother to Hon. Dr. Curtis James Bird, St. Paul’s (Middlechurch) of the Legislative Assembly of Assiniboia. – [965-968] James 11, Thomas 9, Mary Isabella 3, David 1. –  Henry George 6, Elizabeth J. 4, John Rupert 2. – [874-876] Margaret Mary Ann 7, Elizabeth 5, Jemima 3. 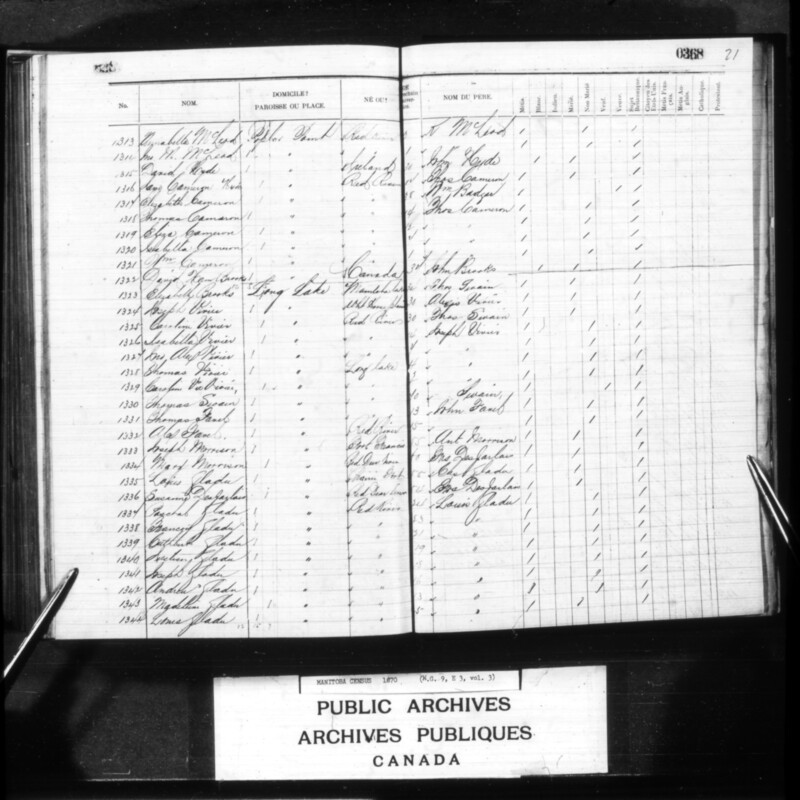 Note: See “[What Can] be Made by Red River Farming,” Nor’-Wester (28 December 1859), 2, for a description of Oliver Gowler and Mary Braybrooke’s farm experience. Ann Miller Gowler contributed comments to What Women Say of the Canadian North- West, a pamphlet written by Alexander Begg for the Canadian Pacific Railroad and published in 1886. – [901-906] John James 12, Andrew 10, William 8, Oliver 6, David Thomas 4, Charles 3. 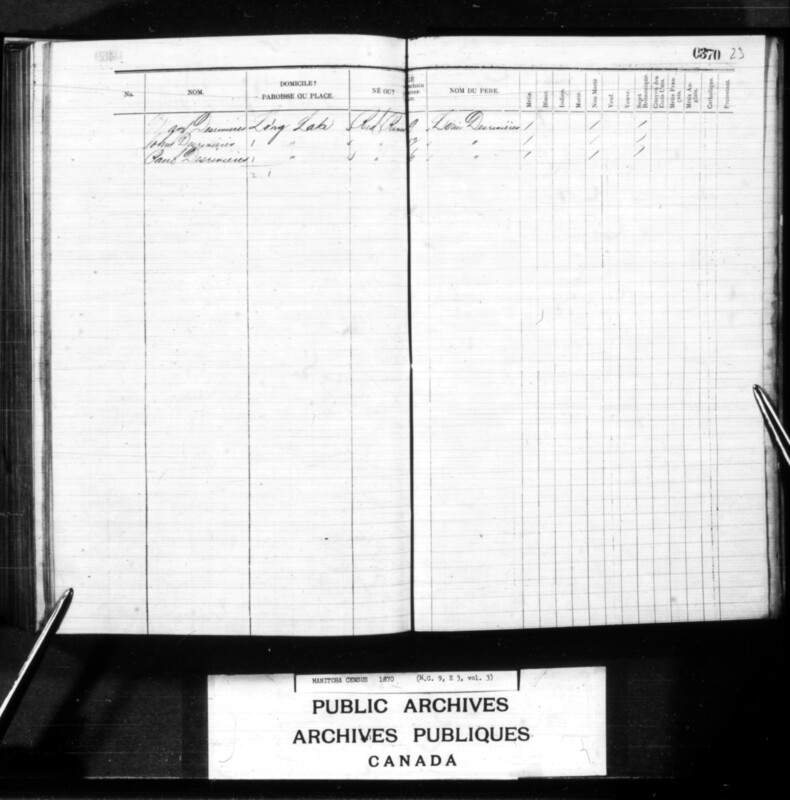 Note: See “[What Can] be Made by Red River Farming,” Nor’-Wester (28 December 1859), 2, for a description of Oliver Gowler and Mary Braybrooke’s farm experience. 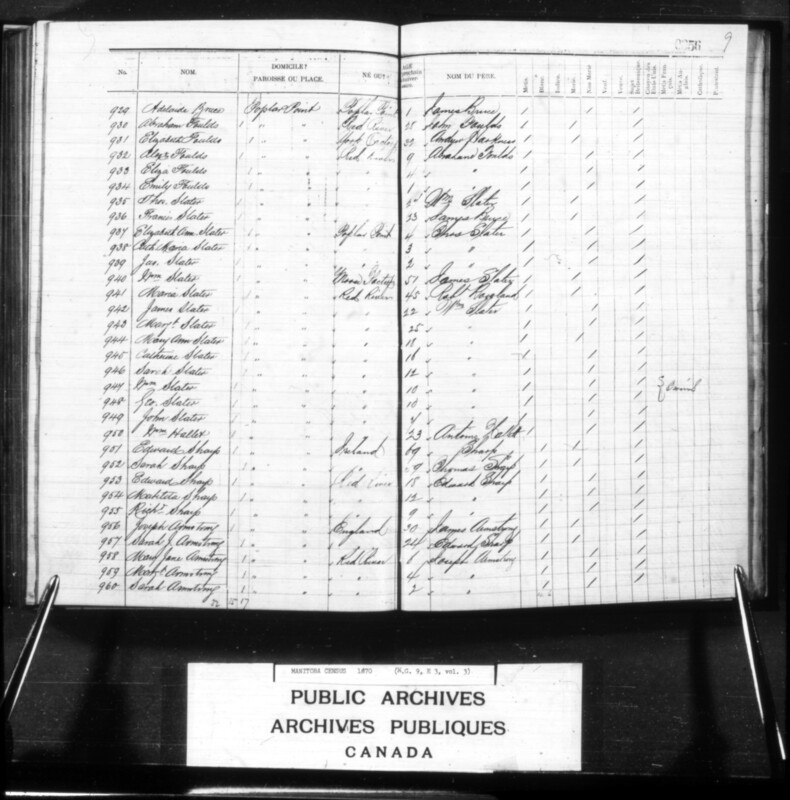 – [918-921] Eliza 7, Maurice E. 5, Flora Ann 3, Albert Scott 1. – [925-928] Letitia A. 17, James Charles 15, Mary Jane 11, John James 8,  Adelaide 1. – [932-934] Alexander 9, Eliza 4, Emily 1. – [937-939] Elizabeth Ann 4, Catherine Maria 3, James 2. – [972-982] William 22, James 20, Henry 19, Charlotte 17, Alexander 15, John 12, Elizabeth 11, Alfred 9, Benjamin 7, David E. 5, Albert 3. –  Baptiste 24, [989, 991] Jane 19, Caroline 16. – [985-988] William Robert 6, Mary Elizabeth 10, Alexander 4, Caroline 2. – [889-891] Isabella 4, Margaret 2, Ellen 1. – [1004-1005] Adelaide 2, Edith Agnes 1. 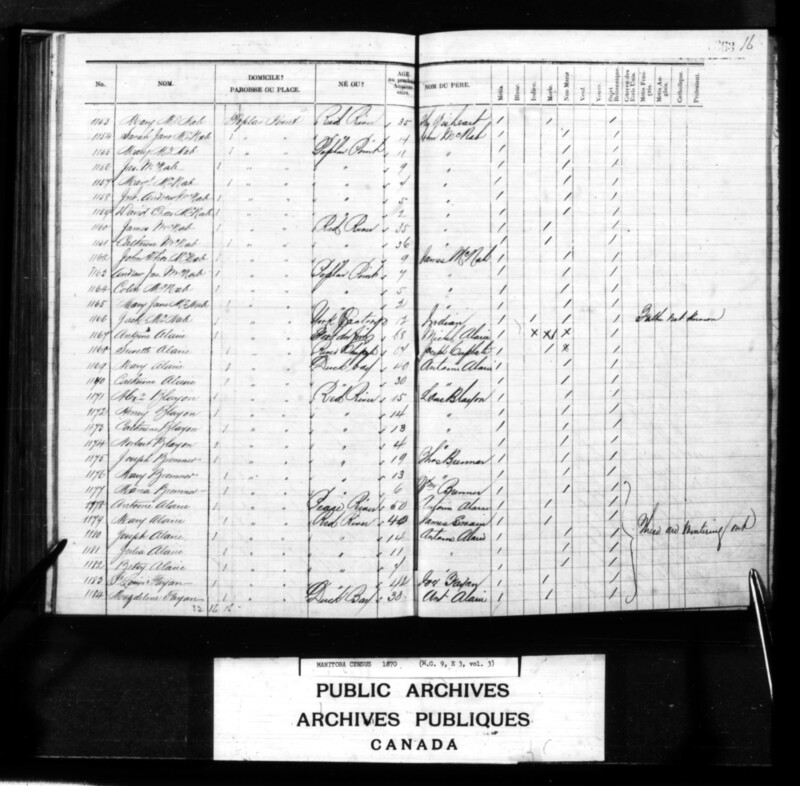 – [1007-1013] Elizabeth Mary 13, George 12, Margaret 10, William 8, Jane 7, Donald H. 3. – [1019-1021] David 25, Annie 23, Herbert Charles 22. NB: a David Taylor and a Herbert Taylor were arrested with the Portage Party. See “Prisoners,” this site. – [1025-1026] Thomas 2, Charles 1. NB: an Alexander Taylor was arrested with the Portage Party. See “Prisoners,” this site. – [1133-1138] Mary 19, Henry 16, Robert James 14, Alexander 6, Ellen 4, Annie 1. –  Frederick James 9 (adopted son of Isabella Sanderson). – [1042-1048] Ellen A. 18, William Charles 13, Jane 11, Mary Ann 9, Harriet 7, William 5. – [1069-1073] James 10, John 9, Donald 7, Margaret Sam? 3, Ellen Jane 1. 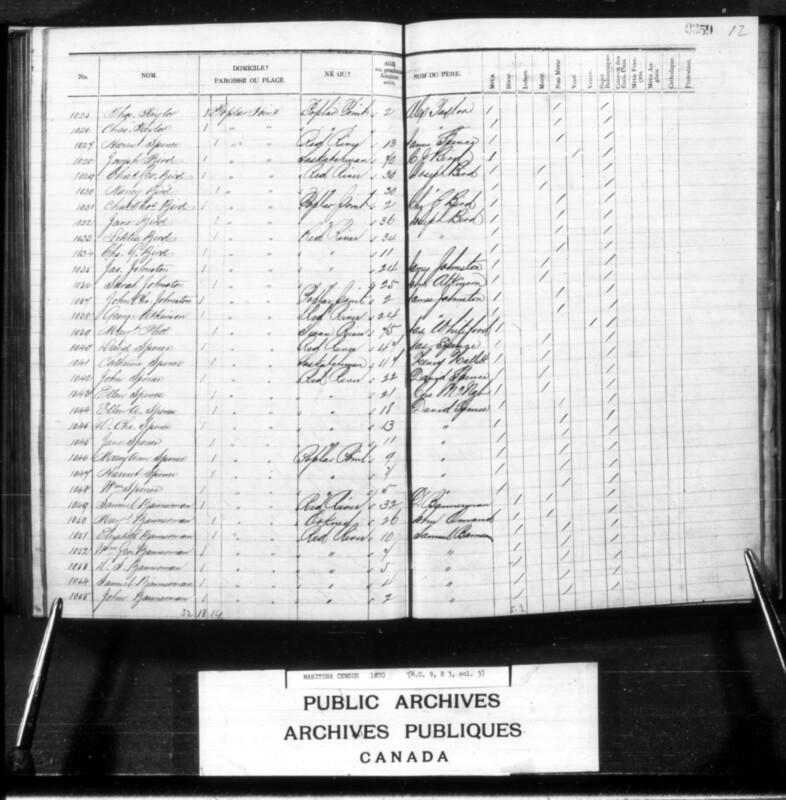 – [1051-1055] Elizabeth 10, William George 7, D. S. 5, Samuel 4, John 2. – [1058-1061] James 12, Alfred 9, Henry 7, Charles 2. – [1069-1070] James 10, John 9, Donald 7, Margaret Sam. 3, Eliza Jane 1. 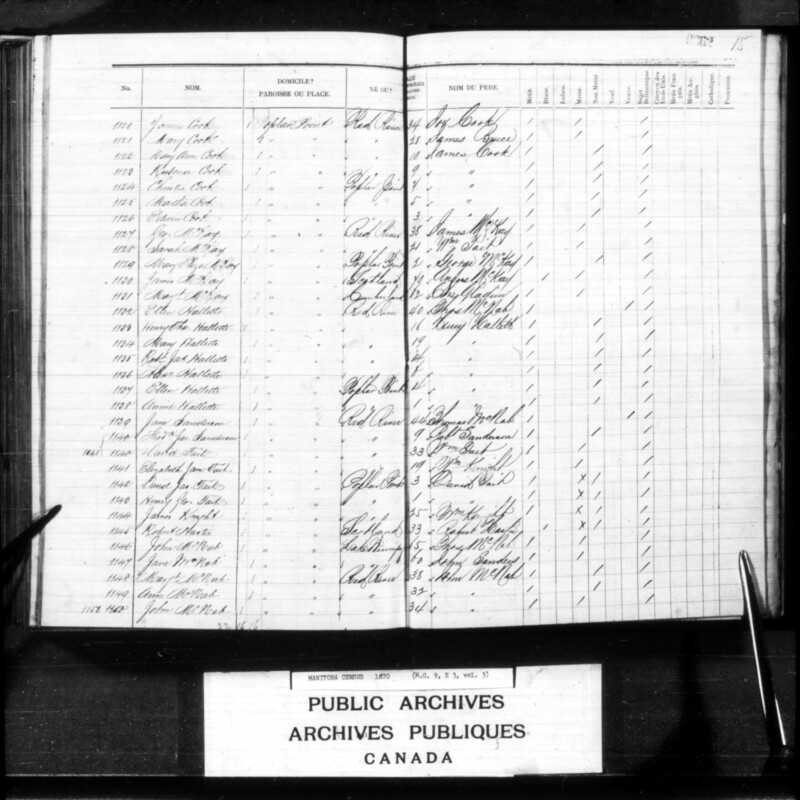 – [1076-1080] William 14, John 9, Mary E. 7, Alfred H. 3, George Thomas 1. – [1088-1089] Jemima 3, Archibald 1. – [1083-1084] Alice 5, Henrietta 2. – [1092-1096] Caroline 12, Philip 10, Colin 7, Alfred H. 4, Margaret 2. – [881-882] Martha Ann 2, William Henry 1. – [885-886] Mary Jane 3, John Edward 1. – [1100-1105] Charles 10, Catherine 8, Maria 6, Thomas William 4, Elise H. 2, Alexander 1. – [1108-1109] William 6, Catherine 1. [Probably] Poo-pee/ Margaret Gunn Tanner photographed at age 104 in 1910. 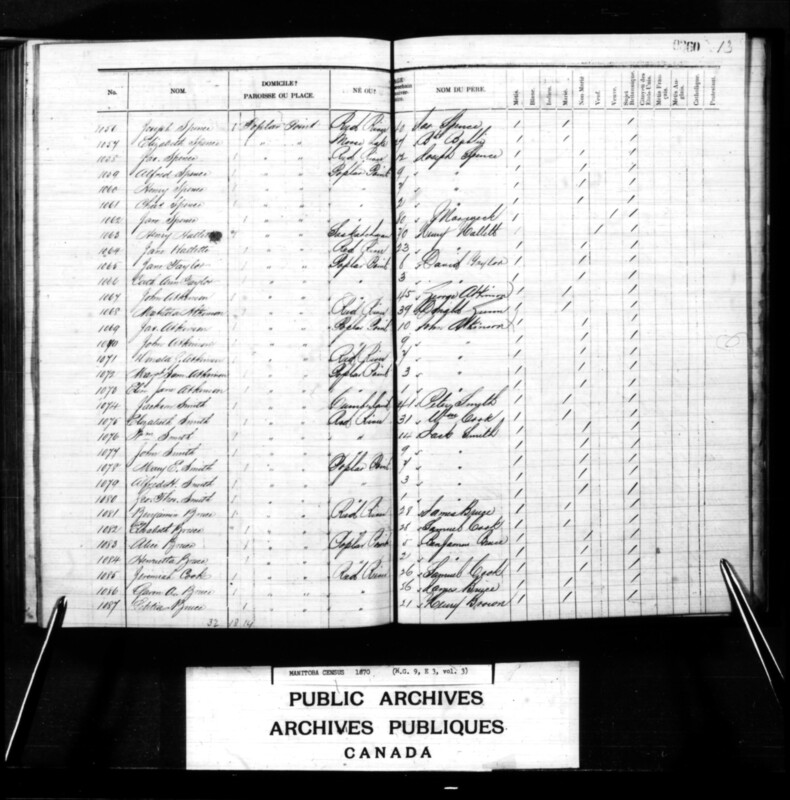 – [1116-1119] John Sinclair 17, William Sinclair 16, Urbain Sinclair 8, Flora Sinclair 6 (Métis, children of James Sinclair and an unidentified woman). – [1122-1126] Mary Ann 10, Rubina 9, Christie 7, Martha 5, Edwin 3. – [1142-1143] David James 3, Henry George 1. – [1148-1149] Margret 38, Ann 32. – [1154-1159] Sarah Jane 14, Mary 11, James 9, Margaret 7, John Andrew 5, David Charles 2. – [1162-1165] John Thomas 9, Andrew James 7, Colin 5, Mary Jane 2. – [1169-1170] Mary 40, Catherine (widow of #350 Louis Blayonne/ Blayon) 30/ 39. See also genealogy; genealogy; genealogy. – [1180-1182] [1737-1739] Joseph 14, Julia/ Julie 10/ 11, Isabelle ‘Betsy’ 7/ 8. Winterers. A buffalo hunt family that farmed at St. Charles. See also genealogy. 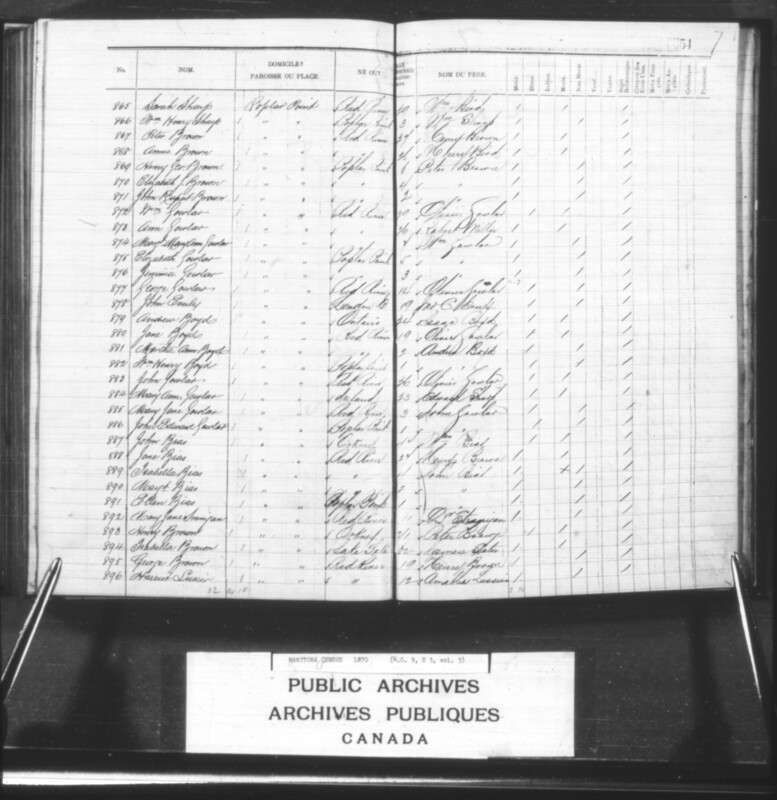 – [1189-1191] Harriet 4, Peter 3, Isabella 1 (Métis, children of Jean Louis Fayan/ Fayant/ Fagnant and an unidentified woman). Winterers. A buffalo hunt family. Winterers. A buffalo hunt family. See also genealogy. –  Baptiste 24, [1206-12010] John ‘Johnny’ 18, Madeleine 12, Joseph 10, Cecile 6, Charles 2. – [1201-1205] Marguerite 10, Sarah 8/ 9, Harriet 6, Baptiste 4, Joseph 2. – [1219-1225] Abraham 13/ 16, Jane 11, Victoria 6, Sarah 5, Madeleine 3, Joseph 1. – [1230-1234] Caroline 17, Edward 12, John 11, Mary 8, Alice M. 6. – [1237-1242] Charles 26, Catherine 19, Maria 18, Harriet 17, William 13, Miles 11. – [1247-1248] Rachel 22, Alexander 20, [1249-1253] Margaret 18, George 16, Catherine 13, Mary 10, Henry 9. – [1256-1258] Alexandre 7, Elizabeth 3, Adolphus 1. – [1296-1303] William 14, John Robert 13, Harriet Ann 11, James 9, Jane 8, George 7, Elizabeth 5, Mary 2. – [1269-1273] George 13, James 11, Charles 8, Emelia 5, David 1. – [1275-1276] Estelle 10, Eugene 7. – [1281-1288] James 16, Andrew 13, Caroline 12, Catherine 11, Flora 9, John 7, Samuel 5, Emma 4. – [1291-1293] Albert Philip 14, Eliza 5, David 3. – [1306-1308] George 15, John Black 14, James 11. – [1311-1312] Mary 7, William 4, [1313-1314] Annabella 2, John M. 1. – [1318-1321] Thomas 14, Eliza 12, Isabella 7, William 1. – [1260-1266] Jane Mary 19, James 17, David 15, Thomas 12, Caroline 8, Alexander 5, Charles 2. In 1859 Long Lake was described as “an ancient bed of the [Assiniboine] River, now converted into a narrow winding Lake of great length.” The area made excellent haying grounds. 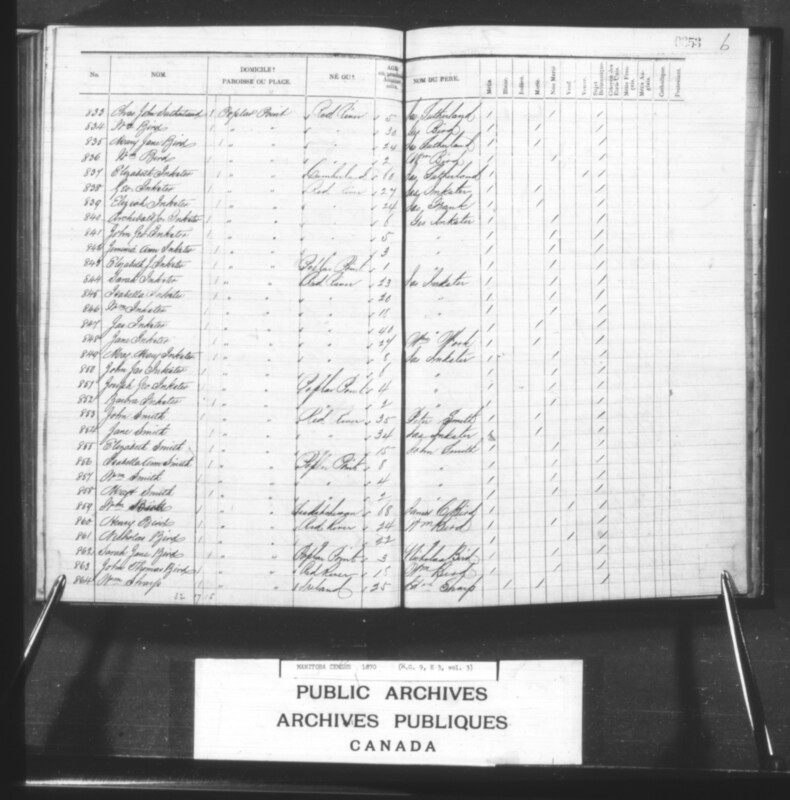 [Sources: Canada, Provincial Secretary’s Office, George Gladman, Simon James Dawson, Henry Youle Hinde, Papers Relative to the Exploration of the country between Lake Superior and the Red River settlement (G.E. 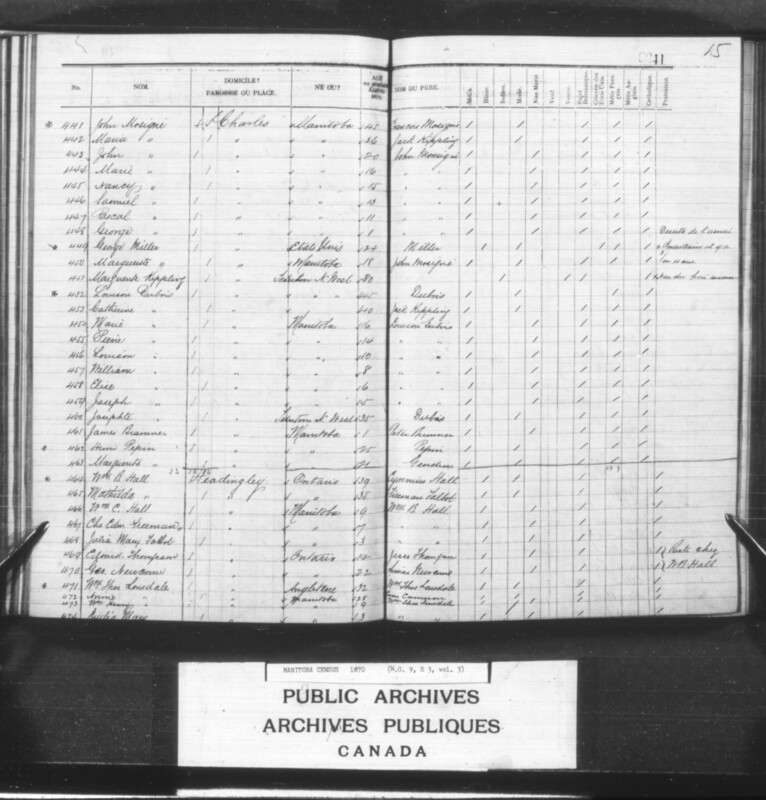 Eyre and W. Spottiswoode for H.M. Stationery off., 1859), 99; Gregory P. Marchildon, Agricultural History (Regina: Canadian Plains Research Centre, University of Regina Press, 2011), 86. – [304-309] Mary 13, David 10, Julian 8, Rosalie 3, Francois 3, Roger 1. – [313-317] Christiana 12, James R. 10, Elizabeth 5, Barbara 3, Andrew 1. – [1326-1329] Isabella 14, John Alexander 7, Thomas 4, Caroline 2. 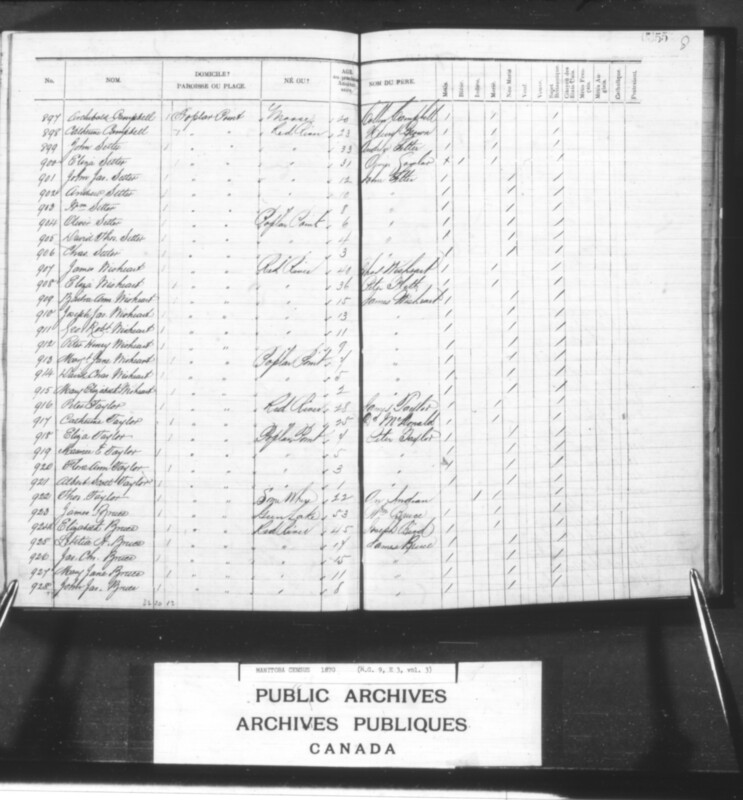 In 1854, at St. Charles Parish; in 1857 at St Francois Xavier Parish. – [1337-1343] Paschal 24, Francois 23, Cuthbert 21, Justin 19, Joseph 18, Andre 16, Madeleine 13. – [1349-1354] Thomas 17, James 10, Margaret 7, Henry 6, Eliza 4, Charles 2. – [1357-1359] Marguerite 21, Mary 9. – [1362-1363] Alexis 7, William John 3. – [1374-1375] Antoine 23, Francois 18, [1377-1379] Margaret? 12, John 9, Paul 6,  Marguerite 4. At St Vital Parish in 1851. 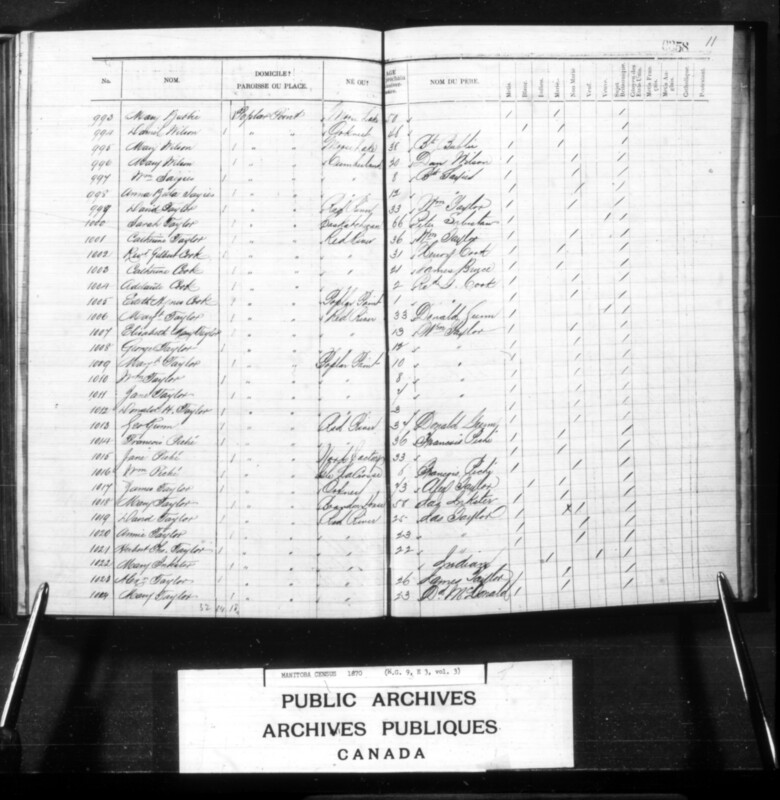 Marie Lambert’s scrip lists the location of their farm as Baie St. Paul. 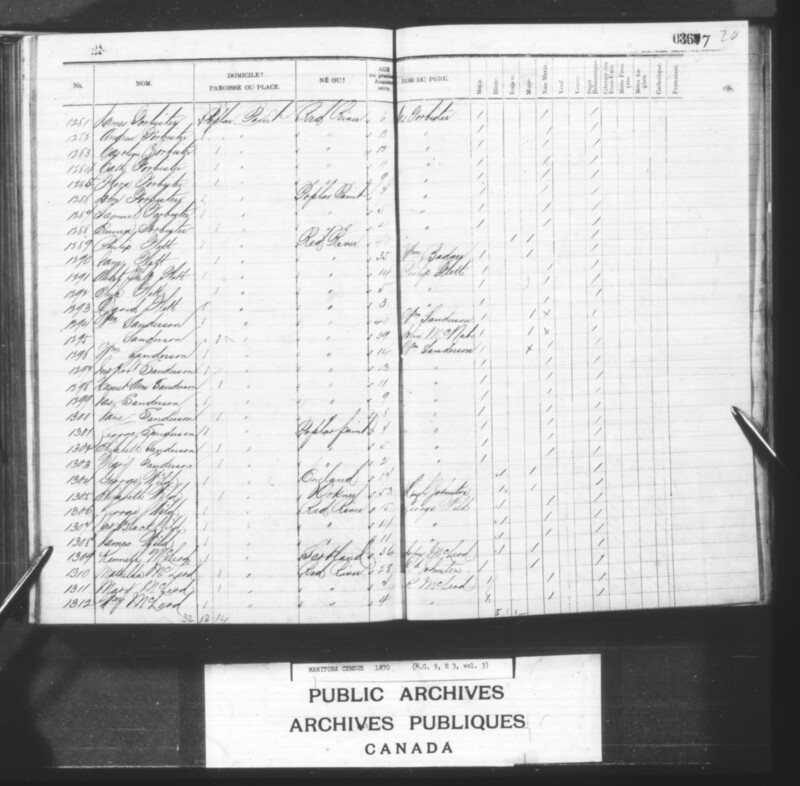 Another son, Louis Desrivieres, was born 1851 and farmed at St. Vital. Do you know of any wedding photos taken in the early days of St Anne’s Poplar Point? Matthew and Matilda Cook may have been married there and I have a family veil which I am trying to put in context. 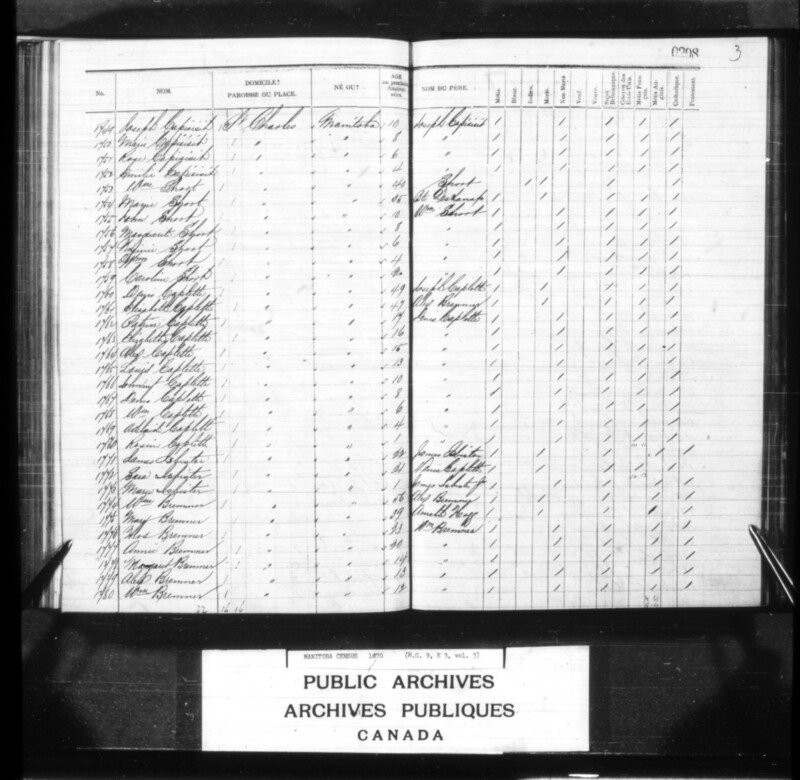 I was adopted out at the age of 1 year old, I believe I am from the Tait family, I believe I have learned that Thomas Toby Tate is from the Muskowequan band in saskatchewan, he was married to Marie Philomene Tate,,,,,any further info.eat help. here we are in May 2016…still looking for info on Thomas Toby Tate….muskowquan connections…. 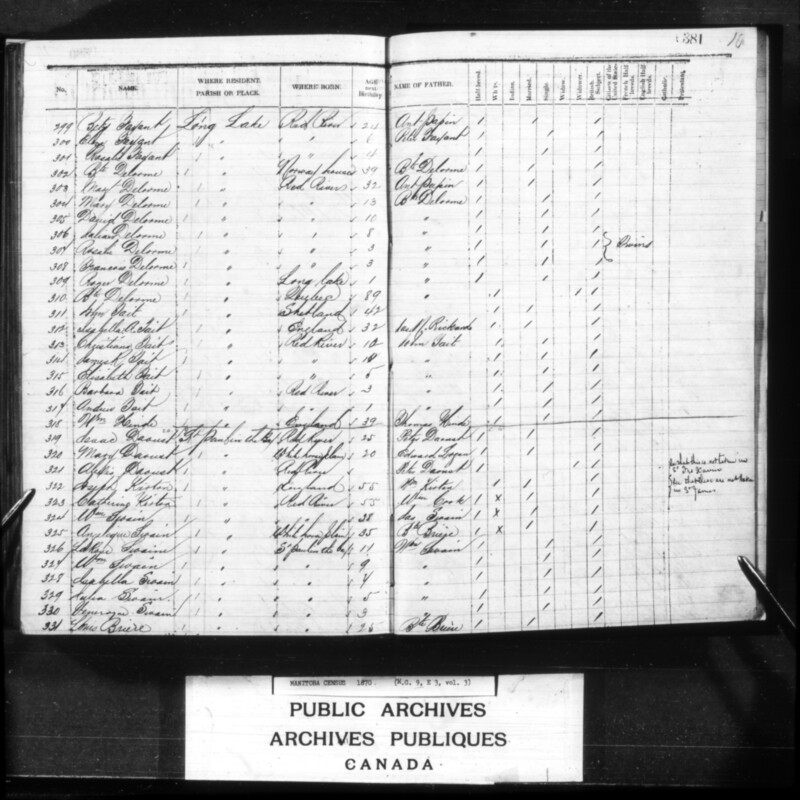 Thomas Tate’s parents were Joseph Tate and Margerite Desjarlais…..Thomas Tate was my Great Grand Father….any family out there?